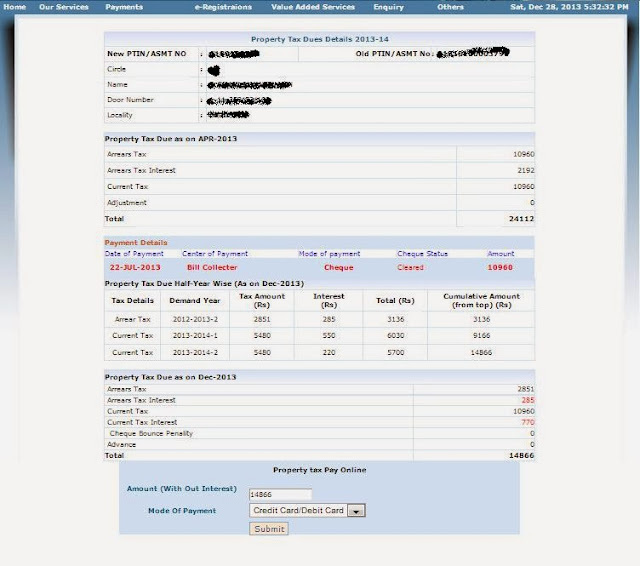 Updated: 24-Mar-2015: Click here or below for updated method for GHMC paying property tax online. You can make payment of GHMC Property Tax online. Check complete procedure here. 1. Your GHMC Circle, Visit GHMC Circles to learn about your Circle. 2. You need to know about your Old or New Property Tax Identification Number or PTIN Number. 3. You can learn about your GHMC Circle and PTIN Number from the Property Tax Notice for payment. 4. Once you know about your circle, you can contact your GHMC Circle Property Tax Inspector for any clarification. To know about your Property Tax Circle Inspector Click Here. 2. Once you have entered the details, click submit. Next page shows you details of your Arrear Tax, GHMC Current Tax as shown below. 3. You can make GHMC property tax payment through Credit Card or Debit Card or Netbanking. Select the correct option and click submit for Online Payment of GHMC Property Tax.. So go and pay GHMC property tax online using ghmc.gov.in easily. Please don't pay online. I paid my property tax..it got deducted from other persons account. It cannot get deducted from anyone else's account until you have his login details. Yes, it does look like they have removed it. Will update on the new procedure soon. Above procedure has been updated with the latest procedure to make GHMC Property Tax payment Online. Though, I've registered for online payment, the particular department is not visible on the history list. You can visit this link http://210.212.212.114/tax/taxdueshome_new.asp to make the payment. How to get a new door number for an open plot????? Once approval for building permission and other necessary permissions are obtained a door number will be assigned to the plot. Site is down for maintenance. Please check back again. is the site still down ? I have been allotted LIG -1/10 Flat by APHB and Notice is coming on the name of B.Anasuya. Sir, to pay house tax, am trying to pay online, but site was down, please take action in this regard. The link is opening now, please check and revert back for clarifications. Looks like the tax details are not updated. as I am unable to see the tax dues. Please let me when the site will be updated. I'm really scared about this ghmc app. even after payment of property tax, it is showing as due in ghmc website. Technical issues with ghmc.. Looking for some help, whom to contact about this..
GHMC SHOULD RESOLVE THIS IMMEDIATELY. How to get this updated in GHMC propert tax records. Is it resolved for you ? What did u do to resolve it? Please share.. i'm also in same kind of trouble..
same with me...I have the transaction reference number...but it is not reflected yet..
GATE WAY ,CITRUS PAY IS TAKING 3 DAYS TO SETTLE. LAST YEAR IT WAS BILL DESK ,IT WAS GOOD. NEW COMMISSIONER ,NEW GATEWAY.KEEP IT UP SOMESH. GHMC IS NOT LIKE GROWING TAMMIRIND TREES IN ANANTAPUR. LODGE A GRIEVANCE WITH GHMC. Please advise is this resolved I am also having same problem. yes. you raise a grievance in ghmc site and they'll process it. I have paid the property tax on 26/06/14 on line. AMT deducted from bank a/c. But transaction was not successful, showing to send mail to citrus. How to resolve this. I have paid the property tax before April 31 2014. But I have not been given the 5% rebate which was announced by commissioner at the eseva . Is it will be adjusted in next year bill or I have to approach the GHMC circle office Uppal. Hi , This is with reference to grievance number 2014-11-W121342, my property tax paid to the tax collector via cheque is not updated yet on site is reflecting as arrears this year, although raised complaint yet no response, pls advise ! This is a phishing website.. So many people paid tax thru this site and no one got receipt.. What does it mean rohit Jain? Hi Varun , link seems to have changed. Try http://www.ghmc.gov.in/tax/taxdueshome_citrus.asp .. this is not a phishing website.. we are not asking you to pay from here but just giving information. The people who have paid from cheque also have not got record updated in ghmc..that is a technical glitch from ghmc side.